Sometimes, in particularly problematic areas (e.g. in seaside resorts), significant signal oscillations may occur in the antenna, which can lead to system malfunctions in certain timeslots. Indeed, during the day, the relative refractive index of the troposphere is subject to changes depending on the variation of temperature, pressure and water vapor content. This may reflect, therefore, in signal instability phenomena due to the propagation of the waves in the free space and to the influence of the sea surface. Such variations in propagation may also become stronger in the summer due to thermal swings and the presence of high humidity. To solve these problems, the installer can use new amplifiers with Automatic Gain Control (AGC). 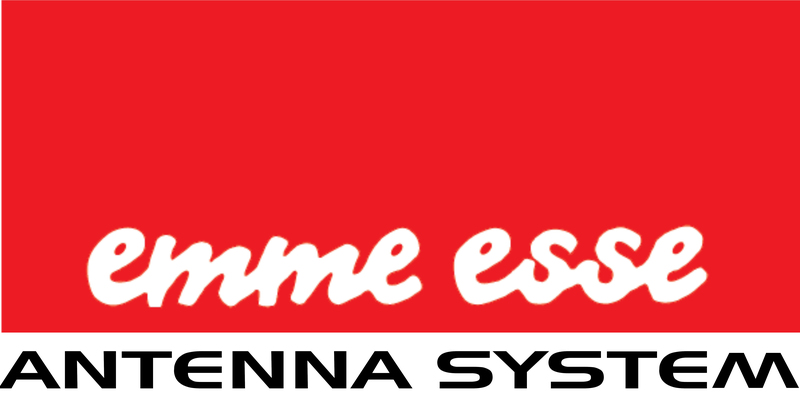 Thanks to the AGC, the installer can manage the variations of the signal captured by the antennas automatically keeping it within the range that ensures correct reception. The new preamplifier for UHF antennas cod. 81942AG with Automatic Gain Control has been specially designed to be directly applied to the dipole of a smart UHF antenna. Thanks to the excellent compromise between maximum output level and noise figure, it can be used both as a preamplifier and in the presence of non-critical signals to increase its level as much as serving a few outlet installation. Powered by 12V or 5V and fully shielded. New Mast Amplifier with Integrated LTE Filter and Automatic Gain Control. The metal body and the “F” connectors give a high degree of shielding. The model has a good linearity on individual inputs and an excellent signal / noise ratio. The good output level and the separate VHF / UHF amplification guarantee a low intermodulation coefficient. The outer case made of shockproof plastic provides an innovative system for fast cable connection and the best protection against atmospheric agents. These products comply with current EC marking regulations. Available in log or VHF – UHF input configuration. With a jumper you can choose the configuration with single log input or two VHF and UHF inputs. Ideal for distributing DTT signals in small condos. New self-powered indoor head-end with integrated switching power supply, LTE filter and Automatic Gain Control. The amplifier is shielded by die-casting mechanics. The input VHF signal setting is performed by attenuators or potentiometers whereas the UHF signal gain is adjusted, based on the input signal power. There is the possibility of remote power supply from the single inputs via internal jumpers. Available in Log input or VHF-UHF input configuration. With a single jumper you can choose the configuration with single log input or two VHF and UHF inputs. Ideal for distributing DTT signals in small condos. The All-in-One amplifier cod. 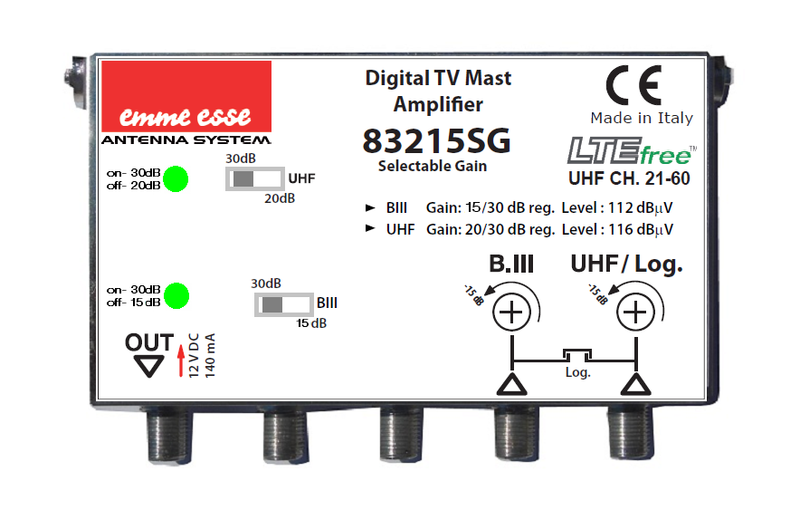 83215SG is part of a series of mast amplifiers designed to meet the multiple needs of LTEfree TV signals. It is an extremely versatile product that allows you to adapt to various TV-set configurations. The particularity of this amplifier is in fact the ability to be configured in 8 different combinations that differ in UHF / VHF bandwidth and input types (VHF / UHF or 1 single Log). These different configurations can be managed directly by the installer on the system, by modifying, in a very simple and intuitive way, the position of some selectors or jumper. Let’s have a look at the benefits of choosing an All-in-One amplifier compared to a traditional switching head-end. When making a TV system, the signals captured by the antennas must naturally be mixed and amplified and then sent to the distribution network. The choice of the type of TV-set to be used must take into account both the characteristics of the input signals (bandwidth, antenna number) and the complexity of the system (number and distance of user inputs). At the output of the amplification system, the signals to be distributed must have sufficient power, that is, an adequate level and a good signal / noise ratio to ensure compliance with the CEI standards for all connected TV sockets. Often an installer, especially if working on extensive and highly diverse territorial areas, may need to use switchboard models with different characteristics. All-in-One greatly simplifies the work of the installer, since with a single product, different plant configurations can be managed. The All-in-One amplifier cod. 83215SG belongs to the Emme Esse family of “APG” amplifiers. We supply all models of the APG series with die-casting mechanics and F connectors. The metal body and F connectors provide a high degree of shielding. The outer case endowed with a mast clamp (Ø 5.5 cm max.) is made of anti-shock waterproof plastic with a mechanical tilting mechanism to allow quick connection of the connectors. All models in the series, including the All-in-one, have a good linearity across the amplified bandwidth, excellent separation between individual inputs and excellent signal / noise ratio. The good output level and the separate VHF / UHF amplification guarantee a low intermodulation coefficient. The products comply with current EC marking regulations. The exclusive All-in-One 83215SG amplifier features a selector to choose whether to connect only one VHF / UHF antenna or two separate VHF and UHF antennas. In addition, you can decide on the gain (20 or 30 dB) by entering or excluding an amplification stage. 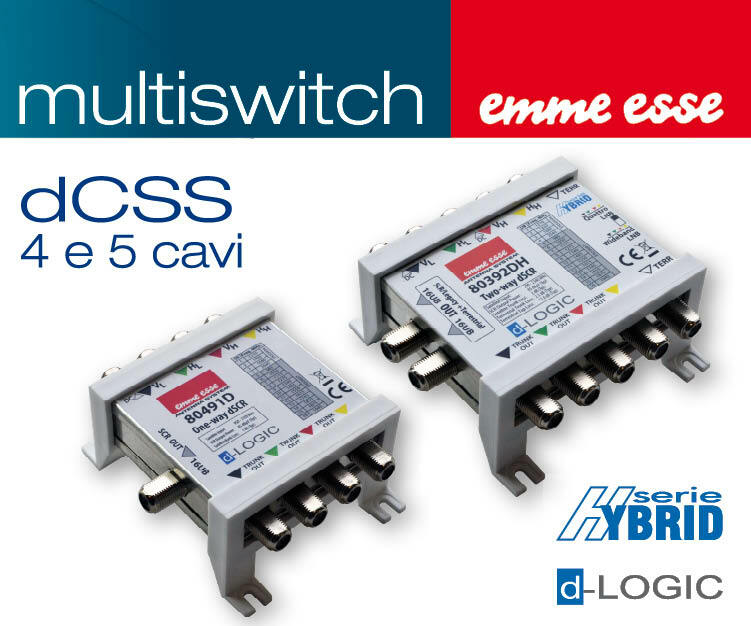 This solution offers great flexibility and a better signal / noise ratio. The available gain is 30/30 VHF / UHF and by means of a 2-way selector, it is possible to exclude an amplifier transistor by decreasing the gain of 10/15 dB. Within the amplifier, a jumper is positioned in such a way as to select input types: 2 VHF / UHF inputs or 1 single Log. – Case for outdoor with innovating watertight closure and tilting movement for convenient fixing of connectors.